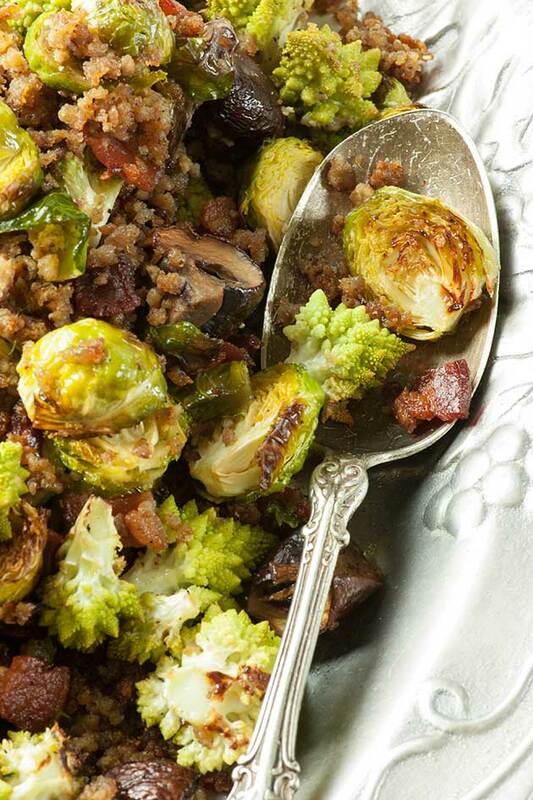 Done right, Brussels sprouts are divine. And when paired with bacon—oh my! When paired with bacon AND sausage—oh, my, MY! Done right, Brussels sprouts are divine. And when paired with bacon—oh my! When paired with bacon AND sausage—oh, my, MY! I’ll wager now that there won’t be a meat-eatin’ picky eater who will pass on this dish. To further dress up this roasted Brussels sprouts dish, we’ve tossed in baby bella mushrooms and lovely broccoli Romanesco—that beautiful, sea urchin-looking, lime green kin of cauliflower. 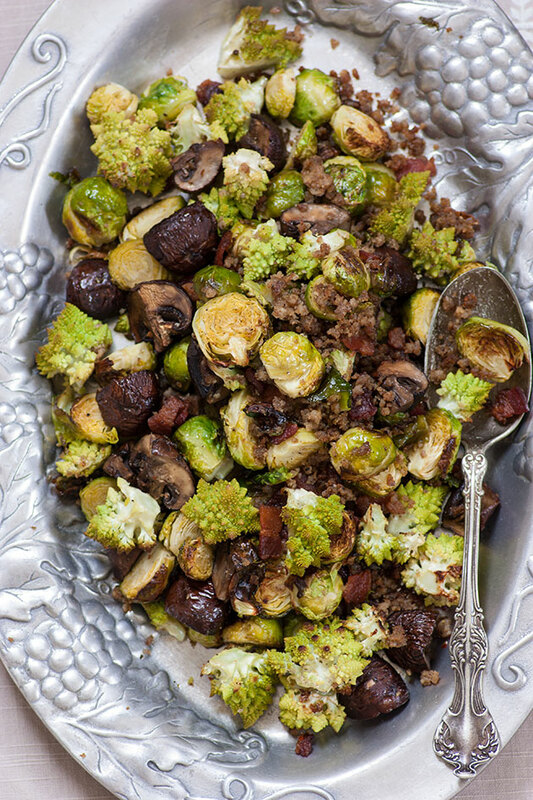 If you can’t find broccoli Romanesco, just substitute with additional Brussels sprouts. In a medium skillet brown sausage until you have some good crispy bits. Transfer to bowl of food processor and pulse until minced. Set aside. Dice bacon and add to skillet. Cook until crisp, reserving rendered fat. Transfer with slotted spoon to plate lined with paper towels. Set aside. Preheat oven to 400?F. Line a baking sheet with parchment. Prepare the vegetables; Cut off the brown ends of the Brussels sprouts and pull off any yellow outer leaves. Cut in half or quarter. Quarter mushrooms. Detach florets from the head of the broccoli Romanesco. Toss vegetables, bacon, and sausage in a large bowl with 3 tablespoons reserved bacon fat. Spread onto baking sheet and season with salt and pepper. Oh My! I want this now. Fab recipe. Now I'm craving this. I've never heard on broccoli Romanesco. Where on earth did you get it? What does it taste like? I love my food all mixed together so this is right up my alley! Hold the meat and I am in! I love all the veggies you used. Roasting brussel sprouts for my pizza as I type! And I bought Romanesco at the Farmer's Market today! Yum!